Plant development is a process from germination of seed to vegetative growth, flower initiation and development, fertilization and finally to the next generation seed formation. Light is very important for every stage of plant development. If there is not enough sunlight or light, they will slowly withered and even die. Ordinary light also cannot be enough for the plant. It's best to help it grow with LED plant light or fluorescent grow light. 12 months warranty 100% money back. The spectrum of light is important to horticulture, get the best light color that plants need. Plants growing need bright light, when lack of it, they get tall and leggy. Enough usable light with less electricity; the light should have the power to produce much light with less power. A long lifespan and working light is good for your plants. Plus, it need to be used under all stages of growth. Lower working temperature led light will take care your plants better than others. 1.This light can connect up to 6 grow lights together. 2.This light is all-in-one design, one unit, contains 2 lights. There are two switches so you can turn each light on/off independently. plug and play. can not be replaced. 3.keep it between 12-39 inches, this will ensure that the plant receives the most reasonable light. 4.Remember to keep enough water for the plants when you use the grow light. ✔ Full spectrum have significant effects on plant health and growth, effectively promote plant photosynthesis. ✔ 30w ultra bright. With reflector, the light effciency can increase 17~20%. 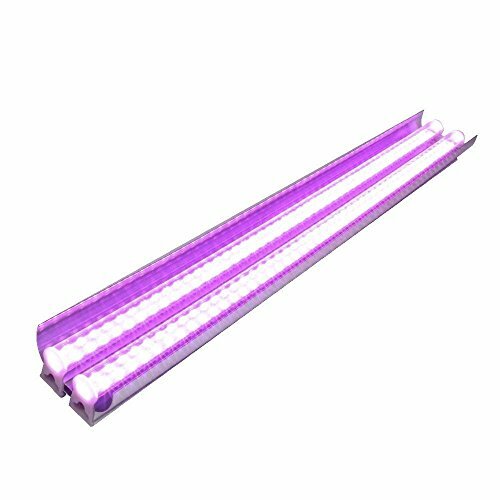 ✔ Low power consumption, instant start, no flicker, no noise, low work temperature, energy saving 45% than traditional grow light. ✔ Plug and play direct operation, no wiring and reconstructing needed. ✔ WARRANTY: 12 months warranty 100% money back. Concact us for an easy and fast replacement. If you have any questions about this product by Monios-L, contact us by completing and submitting the form below. If you are looking for a specif part number, please include it with your message.